This deep black bowl is filled with grains dyed crimson from the bleeding beetroot. It is such a beautiful and dramatic colour that it shocks the senses. You are not quite sure what to expect. 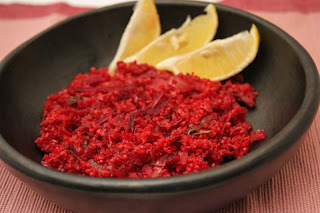 When I originally saw the recipe for this Beetroot Bulgar Pilau, I thought it would be similar to the beetroot risotto I made early this year, but I have to say this was much superior. It is so good that I will certainly be making it again. This Gothic crimson dish was sweet from the caramelized red onions, earthy from the beetroot and zingy from the squeezed lemon. I enjoyed every mouthful. Ladle into bowls and eat with a spoon. Serve with a dollop of soured cream if you wish. Heat the oil in a large pan, add the onions, garlic and cook over a medium heat until caramelized, about 15 minutes, stirring frequently to stop them from sticking. The colour is gorgeous! Never know what to do with bulgar wheat, I have a packet just lurking in the back of the cupboard but now it has a purpose! Yum! I think the colour is quite evocative too! Please do give this a go, I hope you enjoy it as much as I have. It is rather pleasing. Its a colour I'd be happy to wear too. This looks delicious, and I love the idea of adding lemon & mint to it, just the thing to perk you up on a cold & grey winter day! I've done beetroot today too! This is such a gorgeous colour and a great tip about using bulgar, thanks! T'is the beetroot season. I've seen it featured on a number of blogs this week. Please do give this recipe a go, its very surprising. This dish is exceptionally good, and I am not particularly a lover of beetroot. Yes, you are right and I have to agree - seasonal. The cumin and hint of chilli do come through too. 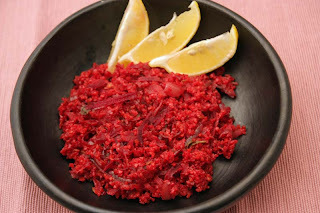 I love bulgar & beetroot! This must be delicious! Wow. Am going to have to try this too at some point. I can't keep up with all your recipes but have to just tell you...you've kicked started my obsession with food again which had flagged a bit after Diwali. Thanks. Love the colour soooo much. This actually is rather delicious. Please do give this a go, it really is a good recipe. Yes, it is pretty amzing. This is a brilliant-looking dish, Mango. I love bulgar any which way, so will have to give this a try. Please do try this, it is absolutely delicious.